Dr. Wieder 's research on the resonant frequencies of the spine was carried out using tuning forks, and she continued to use a set of tuning forks for bone-toning the spine. Although tuning forks are effective in restoring the harmonic resonance of the spine, they are not the most practical or easiest method for applying vibration to the spine. Dr. Wieder realized that a single, tunable frequency generator could replace the tuning forks, and pent years developing a suitable device. The result is the Song of the Spine BoneToner™ Electronic Tuning Fork, which has become the basis for her spinal vibrational therapy. 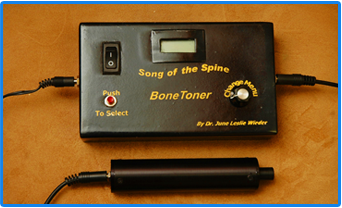 The BoneToner is a hand-held vibration generator that replaces the entire set of tuning forks used for spinal bone toning. A small LCD screen on the front of the device shows which vertebra the BoneToner is ready to tune. The correct frequency is automatically generated for each vertebra. The therapist can change the setting of the device to allow the selection of a any vertebra, and the BoneToner generates the appropriate frequency for as long as the user desires, allowing prolonged treatment of that vertebra. Bone toning may be done before or after massage, bodywork, acupuncture, or chiropractic treatment. Muscle testing should be used to determine if a vertebra needs to be toned. One vertebra, several vertebrae, or the entire spine may be toned in a single session. Each vertebra should be toned only with its resonant frequency. It may be necessary to repeat the treatment at regular intervals until the body regains its homeostatic, balanced state. In addition to its usefulness for restoring the harmonic resonance of the spine, the BoneToner provides researchers with a handy tool for investigating the beneficial effects of vibration. The human body itself is a natural resonator, with each organ, tissue, bone and fluid generating and responding to harmonic vibrations that ripple out in waves. The living matrix of the human body is wonderfully capable of absorbing different kinds of vibratory energy and responding with harmonic vibrations. After the successful introduction of the BoneToner electronic tuning fork for toning the spine, Dr. Wieder began to receive queries from therapists about incorporating additional healing frequencies into the electronic device. This prompted Dr. Wieder to collaborate with a talented electronics designer to develop a hand-held device that outputs a wider range of vibrational frequencies. Trade-named the Harmonic Resonator Electronic Tuning Fork, the new device incorporates the spinal resonant frequencies found in the BoneToner along with vibrational frequencies for seven types of harmonic resonance. The electronic system generates specific resonant frequencies that are converted to mechanical vibrations in a hand-held probe, which can be placed on the body for vibrational therapy. 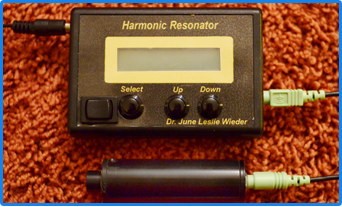 In addition to its use for vibrational therapy, the Harmonic Resonator is convenient tool for researchers who want to study the beneficial effects of vibration. The human spine with its primary and secondary curves looks like a standing wave. Is it possible, asks the author, that energy echoes like a standing wave between these curves in order to maintain the structural and neural integrity of the spine and nervous system? That question led Dr. Wieder into research on the resonance of the spine. 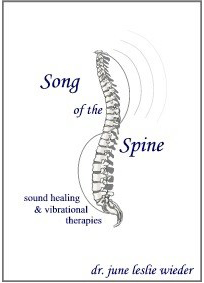 Her studies reveal that each bone of the spine has its own tone and frequency, and that applying specific vibrational frequencies directly to the vertebrae generates a sympathetic response that activates the embedded harmonics that help maintain healthy functioning.